Most people in the USA won’t recognize the name Jaakko Illka. But in Finland he’s a well-known folk hero, the leader of the Cudgel War of 1596. I know the name Jaakko Ilkka because he’s my eleven-times-great grandfather, at least according to research by a Finnish cousin of mine. Finnish church records, which have been the legal repositories of birth and marriage announcements, are all that researchers have to rely on. Those records seem to confirm two lines of descent from Jaakko Ilkka to proven ancestors of mine on my mother's side. One line of descent comes down through my great-grandfather Wilhelm Hirvi, who I’ve written about on this blog before. You can hear a recording of him singing here. The other line of descent comes down through my great-great-grandfather Matti Uhmusberg Hietanen, who I’ve written about on this blog here. 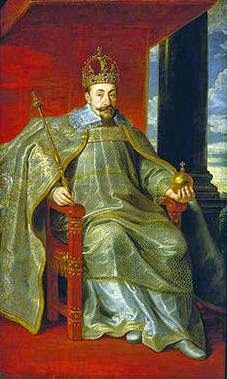 In the late 16th century Finland was a part of Sweden under King Sigismund III. Sigismund lived in Poland, which he also ruled, so to oversee Finland he appointed a governor, Klaus Eriksson Fleming. At the same time Sweden was overseen by Sigismund’s uncle Kaarle. Governor Fleming of Finland and Duke Kaarle of Sweden did not get along. They vied for power, often at the expense of the poorest of the Finnish peasants. The people of the Ostrobothnia region of central Finland resented the feudal military tax imposed to help pay for Sweden’s war with Russia. The Ostrobothnians had been legally exempted from this tax during the reign of Sigismund’s father, in return for their defense of Ostrobothnia against the Russians. But when Sigismund took the throne, the exemption was ignored. Crushing taxation—collected, often brutally, by Governor Fleming’s military—only added to the Finnish peasants’ woes, which already included the loss of men drafted to defend the border and poor harvests of the little ice age. In some places the peasants faced starvation. Small rebellions broke out from time to time, but the taxation continued. In 1585 Jaakko Ilkka (1545-1597), a farmer, lived with his wife and son in Ilmajoki in Southern Ostrobothnia, Finland. He bred cattle on his farm and became a merchant, shipping his cattle to Sweden. From 1586 through1588 he served as the second sheriff of Ilmajoki. This position increased his prestige and his income. He flourished and became the seventh richest merchant in Southern Ostrobothnia, managing shipping to Sweden, Estonia, and elsewhere. His first wife died about 1588. He re-married and eventually had three more sons. 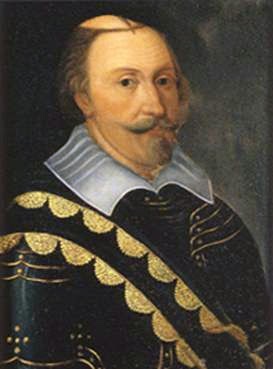 In 1591 Jaakko Ilkka joined the army. As a member of the military he was tax-exempt and collected feudal taxes. He participated in three expeditions in Sweden’s war with Russia. By 1593 his military activity stopped. He collected no more taxes from his peasant neighbors. In 1592 Governor Fleming declared a trade embargo in the Gulf of Bothnia. Merchant shipping in the Gulf of Bothnia virtually ceased. Ilkka concentrated on cattle farming. By late fall of 1594 Sweden and Russia began negotiations to end their war. To support the negotiations Governor Fleming had Swedish troops transported to Finland. The Finnish people, already crushed by military taxes, refused to pay the Swedish forces’ costs. Fleming ordered the military to force collection. On May 18, 1595, the Treaty of Teusina ended the twenty-five-year Russo-Swedish War. Despite the war’s end, Fleming’s militia continued to collect the feudal tax. Fleming wanted the revenue in order to combat Duke Kaarle’s efforts to take the Swedish crown. But this meant little to the Finnish peasants who lived in fear of being robbed, tortured, and having their homes burned if they could not pay. Duke Kaarle, later King Charles IX of Sweden. By late 1595 Duke Kaarle of Sweden was denouncing the oppression of the peasants by Fleming and his military. Encouraged by this, the entire population of Finland’s Ostrobothnia region refused to pay their butter tax. A small force of Finnish peasants approached Jaakko Ilkka with the idea to take back the grain that had been collected as tax since the end of the war. He agreed to lead them. On December 24, 1595, while the military was preoccupied with Christmas celebrations, the rebels attacked the Swedish cavalry in Isokyro and Rautalampi. They recovered their grain and drove the soldiers out of the region. But by mid-January 1596, the Swedish military had suppressed the rebellion and arrested Ilkka. He was imprisoned in Turku Castle in Turku, Finland. Ten months later he escaped. One story says that a draft in his cell led him to a sewer duct that he crawled through to freedom. But the actual duct at Turku Castle is too small for a man to fit inside. Another story says he used a concealed knife to pick mortar from between the stones of his cell wall. He used the holes to climb the wall, then let himself down the other side with a rope made from his coat. A more plausible explanation is that friends, sympathizers, or possibly his second wife’s relatives used their influence to free him. Unrest among the Finns grew. On November 15, 1596, St. Catherine’s Day, Duke Kaarle sent an emissary to a gathering at the church in Isokyro, Finland, urging the people to fight for their rights. He also sent a shipment of distilled spirits. The men at the church decided to stop paying the feudal tax and to defend themselves with arms. They gathered a small resistance army from all over Finland and named Ilkka their leader. In mid-December three groups of these fighters set out marching south by different routes toward Turku. Jaakko Ilkka and Yrjo Kontsas led the main group of about eight hundred, looting and burning soldiers’ farms and crown-owned properties and gathering adherents along the way. The spiked cudgels carried by many of the peasants were effective weapons in piercing soldiers’ armor. These instruments gave their name to the rebellion, the Cudgel War—or as it’s known in Finland, Nuijasota. On December 26, Ilkka and his men, now about 2500 strong, defeated a party of two hundred cavalry soldiers and set up camp in Nokia. On December 31, Governor Fleming attacked the rebels with his army of over 3000 professional soldiers and several cannons. The rebel army defended themselves successfully. During the night Fleming, having failed to defeat the rebels and realizing that other groups of rebel reinforcements were coming, sent emissaries into Nokia to treat with the rebel leaders. The emissaries offered an end to the feudal tax and safe passage home for the rebels. In exchange they demanded the rebel leaders, particularly Jakko Ilkka. Fearing betrayal, Ilkka and several others fled on horseback into the night. Now unable to fulfill Fleming’s demands, the rebel army broke up and began to flee. Fleming’s cavalry attacked the fleeing peasants and a massacre was on. Other groups of rebels were also defeated by the military. Peasants were slaughtered until one local governor pointed out that dead peasants could not pay taxes. Jaakko Ilkka returned to Ilmajoki where he was captured by his neighbors. He was turned over to local governor Abraham Melkiorinpoika, who had orders to transport Ilkka to face Fleming in Turku. However, Melkiorinpoika feared that rebels would succeed in freeing Ilkka during the long trip to Turku. He staged a quick court martial in neighboring Isokyro. Ilkka and five other rebel leaders were sentenced to death. Jaakko Ilkka’s exact method of execution on January 27, 1597, is unknown. The standard method of the day was to have the hands and feet crushed, the right arm cut off, and then the head severed from the body. Ilkka’s parts were publicly displayed in Ilmajoki before the rebel army buried him honorably in the local cemetery. The rebellion continued. The climactic Battle of Santavuori on February 27, 1597, was a disaster for the peasants. Many were brutally slain. The Cudgel War, one of the largest European peasant rebellions, ended in failure for the oppressed. Governor Fleming died a couple months later. Duke Kaarle, who had given lip service to the rebels’ cause but provided little in actual support, eventually became King Charles IX. But little changed in the lives of the peasants. 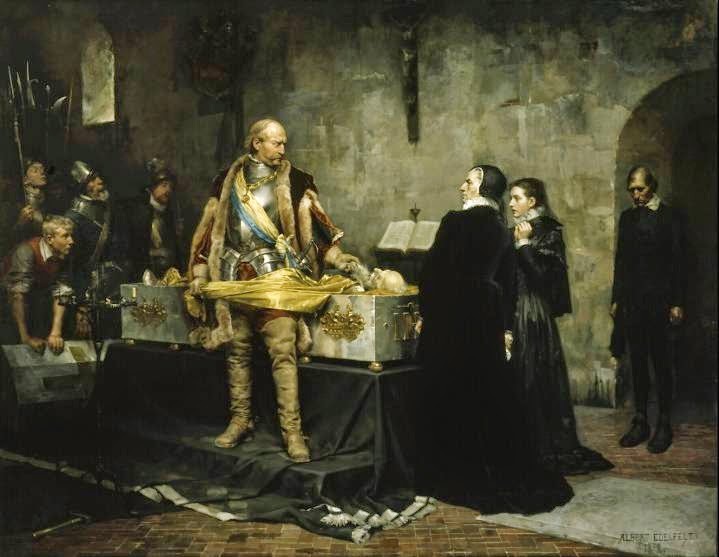 Duke Kaarle insults the body of Klaus Fleming in 1597, painting by Albert Edelfelt, 1878. Jaakko Ilkka, the first Finnish freedom fighter, was hailed as a hero. His example of a common man rising up to lead the fight against injustice has continued to inspire Finland as a nation. Jaakko Ilkka monument in Ilmajoki, Finland. 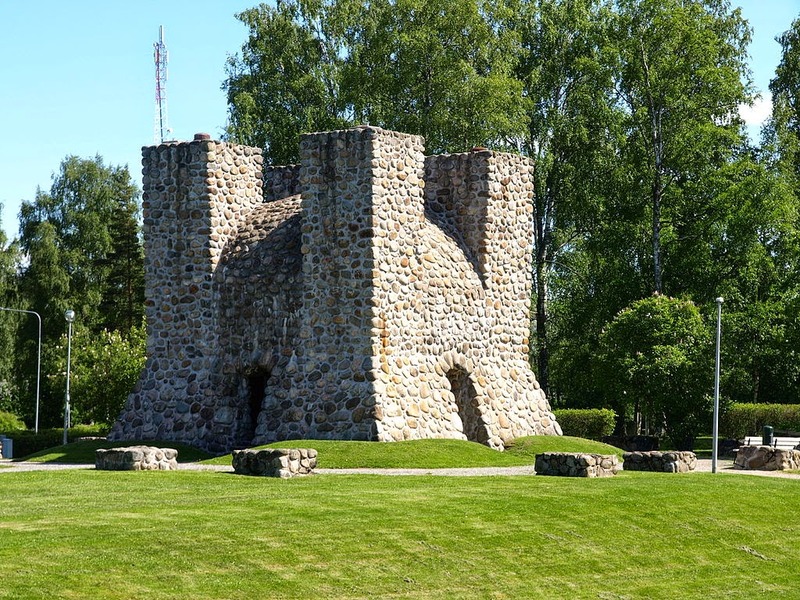 Among the memorials to Jaakko Ilkka is a large monument raised in his home town of Ilmajoki in 1924. In 1978 Jaakko Ilkka, an opera by Jorma Panula with a libretto by Aarni Krohn, was first performed at the Ilmajoki Music Festival. A recording of the opera was released in 1979. A Finnish television production of the opera was broadcast in 1982. The legacy of the Cudgel War has continued in literature, art, and academic studies. Each year since 2003 The Cudgel War has been reenacted at a camp in Kavalahti, Inkoo, Finland. In 2004, viewers of the Finnish television show Great Finns (Suuret suomalaiset) voted Jaakko Ilkka number 75 of the 100 greatest Finns of all time. I have no means to double-check the genealogical research that says Jaakko Ilkka is my forebear since I don’t speak or read Finnish and don’t have easy access to the records. But I’m happy to accept my descent from Jaakko Ilkka as true. Well then, we must be cousins. Jaakko was my 10th great-grandfather. Hi, cousin! Thanks for visiting. I am also descended from Pentti Piri, who was executed with him on Jan. 27, 1597. Hi, Bob! Glad to see your comments here.